Robert Oster is on fire this year. He has put out so many amazing inks, it's hard to keep up with them all. Robert Oster Lake of Fire (fountain pen ink version) debuted at the San Fransisco Pen Show this year. Earlier this year, the Lake of Fire inkArt.ink version was available with the purchase of the James Finniss Serendipity pen. The ink I have is the fountain pen version. I got my sample from Vanness Pens. Lake of Fire is a dark blue with pink/red sheen. Robert Oster has released so many blue inks this year, but this one is just a bit different from the other blues. Ink swabs for comparison, left to right (top to bottom for RSS): Robert Oster Blue Water Ice, Robert Oster Soda Pop Blue, and Robert Oster Lake of Fire. To see the Robert Oster inks together, click here. Blue Water Ice is the lightest, Soda Pop Blue is one shade darker, and Lake of Fire is a bit darker, but the color also seems a bit more saturated as well. 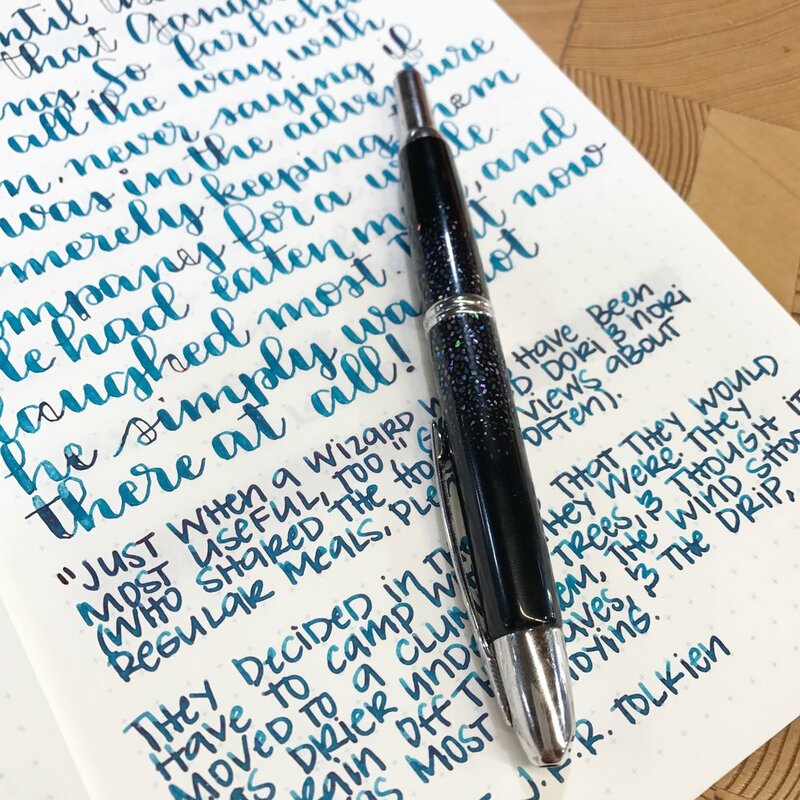 Diamine Asa Blue, Blackstone Sydney Harbour Blue, and Papier Plume Calle Real. To see the blue ink swabs together, click here. I haven't reviewed Sydney Harbour Blue yet, but it seems to be the closest to Lake of Fire, but Sydney Harbour Blue does appear to have a bit more sheen. I used Tomoe River paper, because it's my favorite. I started out with a Pilot 912 FA, and then switched to a Raden Vanishing Point, broad nib. There was a little bit of railroading on the flex nib, but it was nice and juicy in the broad nib. I always thought broad nibs would be too broad for me, but I have really come to love them and they are the ones I reach for the most lately. The broad nib is wet enough to really show off the ink's shading and sheen. This ink is really well behaved, except the dry time is just a bit longer than I would like. I absolutely need a full bottle of this one.